Perfume and colour-free gentle wash. Mild foaming effective soap substitute. Gentle soap substitute formulated for use on dry, sensitive skin. Suitable for all skin types. Mild enough for the face, suitable for the entire body. Dermatologically tested. 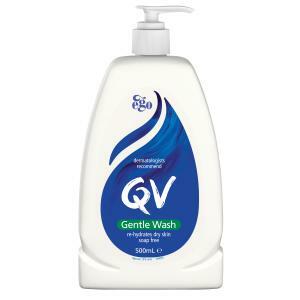 Suitable for use with eczema, dermatitis and psoriasis. Recommended for cleansing dry skin. Maintains skin's natural protective properties. Won't strip away natural oils like soap can. pH balanced, low-irritant formulation, free from fragrance, colour, lanolin and propylene glycol. Suitable for sensitive skin types, including infants and the elderly. Suitable for sun-damaged skin and conditions such as dermatitis, eczema and psoriasis.